Bordered by the beautiful McDowell Mountain range, the remarkable community of North Scottsdale, Arizona is quickly becoming the premier place to buy or build a home. The fast-paced economic growth of this area has supported many lovely communities and subdivisions, with a great variety of single-family homes, condos and townhomes. The Scottsdale Airpark can be credited with providing employment opportunities and success to this highly sought after area. 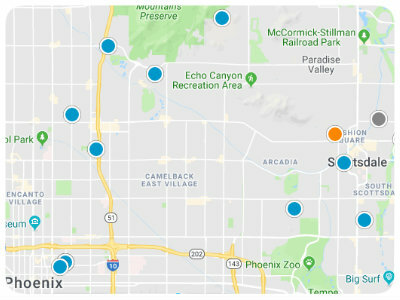 Homebuyers will love the great selection of homes for sale in North Scottsdale, and the many neighborhoods from which to choose, all with manicured hedges and cactus gardens. The variety of home styles available has also created a broad price range between $350,000 for well-situated apartments, to well over $30 million for luxury single-family homes. North Scottsdale’s economic growth has created a stable housing market, and also ensures that the local schools and facilities are top notch. Considered to be the desert version of Miami’s ritzy South Beach community, North Scottsdale has a lot to offer its residents, from outdoor activities to nightclubs, bars and restaurants. The year-round warm weather provides the perfect environment to the impressive wilderness surrounding the community. Any avid hiker, kayaker, or rock climber will appreciate the rugged landscape that is perfect for a host of activities. The beautiful landscapes, and well-developed cityscape of North Scottsdale makes it a great place to live, work and play. If you would like more information about the real estate options in North Scottsdale, Arizona, please do not hesitate to contact us today!